Dai va bene, volentierissimo!!! Un bacione! bhe’ allora un grande in bocca al lupo per il tuo lavoro!!! Antropologia deve essere molto bella! Se passo per Copenaghen ti avverto cosi’ prendiamo un bel caffe’ insieme e tifaccio conoscere la vera Sofi…smmmuack! Carissima Valeria anche il tuo blog e’ veramente bello! Che fai a Copenhagen? Deve essere proprio bella! Io mi sono trasferita da poco a Londra. Trovo che sia una citta’ incredibile! My daughter would love this bus. I would have a hard time getting her off it I reckon. Will have to show her later!! Thanks for sharing. Your blog and your pug are adorable!! You’re a doll for visiting my blog and liking the occasional image, thank you! 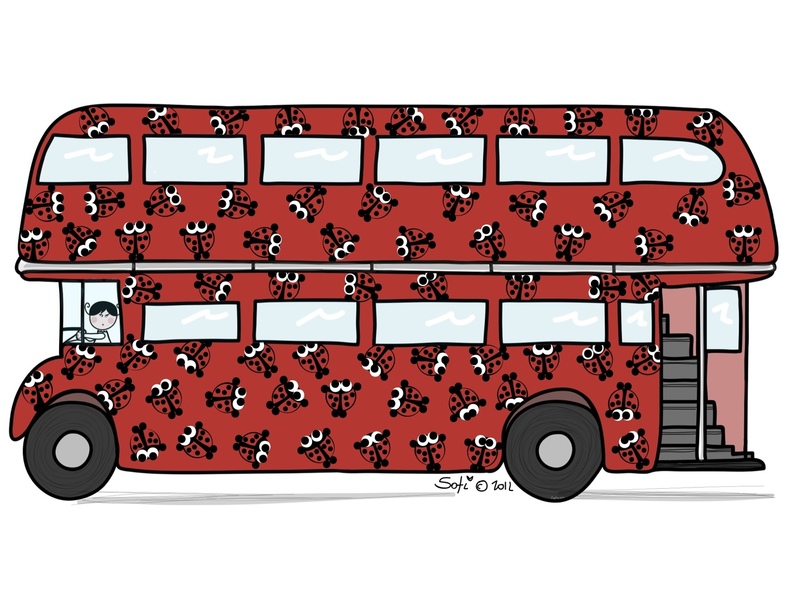 LOVE your ladybug bus! I’d ride the bus way more if it looked like that!! proporrei anche una serie con insetti finti sui finestrini…che ne dici?? ?